Employers are in a state of limbo between one presidential administration and another, trying to intuit the potential impact as potential names of candidates for the cabinet and key administrative posts are floated, debated and named. Much is still in the realm of speculation. One thing is becoming clear: Despite the ambiguity that Trump’s recent comments about possibly preserving some parts of Obamacare, it’s clearly on the chopping block. Any doubts were laid to rest in naming Representative Tom Price of Georgia as the secretary of Health and Human Services. An orthopedic surgeon, Price is an ardent foe of the ACA. He is likely to set his sights on Medicare and Medicaid, too. But what of other workplace issues? A key indicator will be naming a prospective Secretary for the Department of Labor. Several names have been floated, but as of this writing, no definitive pick has been named. PA congressman Lou Barletta has been cited by many as leading the pack of those under consideration – there are some reports that he has been offered the position, but no confirmation yet. Other possible contenders include Andy Puzder, CEO of CKE Restaurants (parent company of Carl’s Jr. and Hardee’s) and Victoria Lipnic, a commissioner on the Equal Employment and Opportunities Commission and former assistant labor secretary under George W. Bush. Wisconsin Governor Scott Walker’s name has also been raised by some, a selection that would be chilling to labor unions. 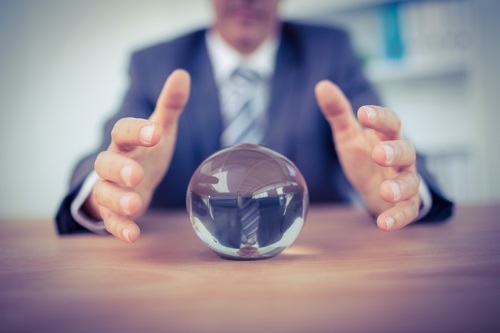 At EHS Today, Sandy Smith offers a not-to-be-missed insider view of Transitioning to a Trump Administration: What It Could Mean for the Department of Labor and OSHA. Her article offers informed perspective by Former Assistant Secretary of Labor Edwin G. Foulke Jr., who spearheaded OSHA under George W. Bush. He also was the chair of Occupational Safety and Health Review Commission (OSHRC) during the transition from George H. Bush to Bill Clinton. Foulke talks about the immediate process, offering a detailed look at the steps and timeline involved in the transition. He also offers his thoughts on what labor and OSHA issues he expects that the Trump administration will revisit. Here are the items he lists, but click through for the details. In other news, CNN reports that Trump will tap billionaire Wilbur Ross for Commerce secretary, As the administration’s chief business advocate, he’s the type of appointment Trump promised: a non-politican executive from the business community. Ross would be expected to help Trump reshape global trade and revive steel and coal, both industries in which he has experience. Ross’s foray into the coal industry, however, ran into trouble in January 2006 when 12 miners were killed after an explosion at the Sago Mine in West Virginia. His company, the International Coal Group, had taken over the mine a couple months earlier. According to federal reports, the mine had recorded 96 safety violations in 2005 that were deemed “serious and substantial.” The mine was fined nearly $134,000, an amount later reduced in court. During his 1941 State of the Union address, Franklin Roosevelt articulated what he considered humanity’s four essential freedoms: Freedom of Speech, Freedom of Worship, Freedom from Fear and Freedom from Want. In American recent history those freedoms have been attacked in different ways and in different degrees. At this moment we are a hurting country in many respects. But right around the corner comes Thanksgiving, my favorite holiday. A holiday on which families come together, put aside their petty disagreements and bond once again with love. No one tries to sell Thanksgiving paraphernalia, except maybe a recently sacrificed turkey. And for a few hours the Christmas shopping season that kicked off around Labor Day doesn’t exist. Following Roosevelt’s Four Freedoms speech, American artist Norman Rockwell set out to depict them on canvas. Rockwell was a humble man; he called himself an “Illustrator,” not an artist. Didn’t think he was good enough for that. On 3 March 1942, his Freedom From Want graced the cover of The Saturday Evening Post magazine. 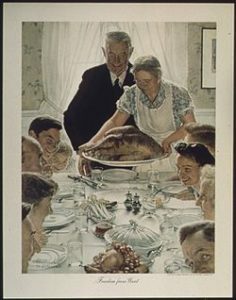 He decided the best way to portray Freedom From Want was through a family’s Thanksgiving dinner. His painting, as well as the three other Freedom covers he painted for The Saturday Evening Post that year, has become iconic. We whose job it is to push the workers’ compensation rock up the Sisyphean mountain, all the while trying our best to help men and women who have had their lives interrupted by workplace injury or illness, have taken it on the chin lately. We’re not alone in that, of course. So many of our fellow citizens are bruised also. Perhaps we, and all Americans, should put that aside and take a moment to ponder Roosevelt’s Four Freedoms and Rockwell’s sometimes loving, sometimes searing, portrait of them and recommit ourselves to the existential exceptionalism that is the American Dream. Perhaps we should grasp tightly the good feelings that ooze out of Thanksgiving and in that moment dedicate ourselves to helping not only those who place their trust in our professional competence but also all who are momentarily lost and searching for better lives for themselves and their loved ones. Joe Paduda posted a roundup of opinions on the results of last week’s election, with contributors sharing their thoughts on how the GOP’s sweep will affect health care, health reform, and the health care system: The election’s impact on health care – experts opine. Before wading in to the fray, Joe reminds us that health care accounts for one-sixth of our GDP, and that it is an incredibly complex, deeply entrenched business. Joe is a brave man with his crystal ball. 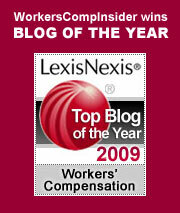 Also on his blog, today he takes a look at Trump and workers’ comp. Last week, he offered his initial take on TrumpCare. Over the weekend, we learn that Paul Ryan plans to phase out Medicare in 2017. Ryan says “What people don’t realize is because of Obamacare, medicare is going broke, medicare is going to have price controls because of Obamacare, medicaid is in fiscal straits.” His proposed “phase in” is contemplated as part of the plan to repeal Obamacare. First, Ryan claims that Obamacare has put Medicare under deeper financial stress. Precisely the opposite is true. And it’s so straightforward Ryan unquestionably knows this. The Affordable Care Act actually extended Medicare’s solvency by more than a decade. Ryan’s claim is flat out false. Second, I’ve heard a few people say that it’s not 100% clear here that Ryan is calling for Medicare Phase Out. It is 100% clear. Ryan has a standard, openly enunciated position in favor of Medicare Phase Out. It’s on his website. It’s explained explicitly right there. People voted for change, but it’s not clear that they contemplated a private Medicare system as part of that change. Have courage, friends. Whatever happens, we will prevail. Brad Wright has a super excellent edition of Health Wonk Review: The Game 7 of Politics Edition. His post skillfully ties two of America’s favorite and most contentious pastimes together: sports and politics. Many good entries from the web’s best health wonks: the ACA, the rigged healthcare system, the Internet of Things and more – check it out. Injury rates are plummeting, insurance premium rates are flat or dropping, medical costs are down as well. Joe Paduda talks about what’s really happening in workers’ comp. If I knew then: Conference Chronicles offers Lessons Learned from Retiring Insurance Executives, a panel at the 2016 PCI Annual Meeting. Roberto Ceniceros offers kudos to employers who are building injured-worker advocacy programs. At Working Immigrants, Peter Rousmaniere keeps us up-to-date about demographics and trends. His latest post of note offers a perspective on the Hispanic vote on November 8. “NCCI just released its Workers Compensation 2016 Issues Report: Fall Edition. It’s a robust 68-page edition, an important barometer of industry results and trends that we think should be on everyone’s reading list. In addition to updated State of the Line results for the workers compensation for 2014 and 2015 and preliminary estimates for Calendar Year 2016, this edition includes articles and reports on a number of key issues. It’s available in both PDF and virtual flipbook style. It’s also available via individual article, which gives an overview of the contents. We haven’t fully digested the whole report, but we point you to a few highlights and excerpts that caught our eye. “Going into these elections, Republicans hold their strongest state presence ever, with a majority in roughly 70% of state legislative chambers and full legislative dominance (holding the majority in both chambers) in 30 states. In addition, a Republican occupies the governor’s mansion in 31 states, 23 of which have a Republican sweep—the party holds sway in both chambers of the legislature and the governor’s office. There are only seven states where Democrats hold that coveted trifecta. These excerpts are just a peek under the covers – many other worthwhile articles are also available, such as an analysis of the OK Opt-out decision, an update on marijuana legalization, and more.